Design Does Not Replace Professional Usability Testing Professional usability testing is not the same as UX Design, Industrial Design or Design Thinking which are concept generation frameworks. Professional usability testing is a concept verification methodology. In order to have confidence that what has been developed will be usable and engaging one must apply a meaningful measure of marketing science. Professional usability testing is, first and foremost, a science-based process that is designed to produce unbiased and robust data on products and software user experience performance. In professional usability testing programs, there is always a need for statistical confidence that can aid management in making objective decisions about the usability and feature/function engagement of hardware or software before design freeze. Professional Usability Testing Does What No Other Methodology Does It is important to note from the beginning that professional usability testing investigates not only the usability of the product but also assesses the emotional connection that core features and functions have with target user population. If a product concept fails to deliver features that resonate with users, the best usability performance possible can do little to ensure the success of that product. The Big Questions Professional usability testing answers two key questions for development teams. Question 1: Is the core feature set engaging and likely to drive deeper engagement and build brand equity? and Question 2: Can the user interact with such features with ease, low error rates and minimal negative transfer from other products they work with every day? No other professional development discipline reduces market risk and improves innovation like professional usability testing. It answers these key questions by providing management with objective, unbiased data on hardware or software usability and feature/function engagement. What Really Is Professional Usability Testing? This question may seem obvious, but in fact hardware and software development groups routinely fail to make use of usability and UX optimization research methods available. This is due to simple arrogance or lack of awareness. Very few UX Design, Industrial Design or Software Development programs teach formal usability testing methodologies. Even when development groups are aware of professional testing, they rarely understand which methods to utilize during various phases of hardware and software development. These new advanced methodologies vary in cost, time to execute and scientific validity. They have all been utilized in the optimization of products and software that demands high-quality user experience design solutions. In order to be successful, individuals with advanced degrees in human factors engineering science apply these methodologies. Professional Usability Testing Is Based On Testing Science Regardless of whether one is employing a standard or advanced usability testing methodology, all professional usability testing programs adhere to well-established scientific testing best practices. Such practices include: design of studies with large enough samples sizes to ensure reliable statistical data; screening and recruiting of respondents based on professional and ethical standards; testing with respondents that objectively represent the actual potential user population; testing with respondents that represent the RANGE of possible users based on professionally developed screening criteria; execution of all research in a company-blind research setting designed to eliminate respondent bias; design of study tasks, questions, and data collection forms that produce unbiased responses; training of all moderators and testing moderators to verify comprehension and study execution; controlled and secure storage of all data, and; design, calibration, and recalibration of all data capture systems prior, during and after each respondent. Analyzing The Data After all respondents have been tested, additional testing best practice continues, including: checking and cross-checking all data for structure, errors and proper respondent assignment; scrubbing and double verification of all data prior to analysis; use of professionally certified statistical analysis software; checking of data before summarizing for the development team; presenting critical findings to the development team in a format that clearly includes all measures of statistical significance; additional analysis of data based on questions from the development team; archiving the entire project for future reference by the research team and client, and; execution of formal quality audit and application of GDP checklist and debrief by the research team including updates to standard operating procedures (SOPs). This is a way of saying that professional usability testing is a science-based method that delivers reliable insights based on proven methods that are designed to reduce risk. Management Assumptions That Are Wrong Based on the description of science-based professional usability testing processes described above, management routinely makes two immediate assumptions. Assumption 1: Professional Usability Testing is too expensive, and Assumption 2: Professionally Usability testing takes too much time to execute. Both assumptions are wrong. The Cost of Failure Versus The Cost of Research The cost-benefit of professional usability testing is a simple calculation: What is the cost of failure vs. the cost of research designed to reduce the risk of failure? For example, SNAP apparently has over 40 million dollars worth of unsold SNAP Glasses sitting in warehouses. The probable failure of the SNAP hardware was largely knowable through the application of professional usability testing for a tiny fraction of the total write-off, not to mention the decrease in market valuation and damage to the SNAP brand overall. Reductions in Overall Development Time The time to execute professional usability testing studies are well aligned with product development timelines and schedules assuming that such testing is planned for in the overall product launch timeline. Professional usability testing can frequently REDUCE time-to-market for a successful product. When properly executed the study findings eliminate features/functions that do not resonate with the user. Such testing dramatically improves usability, thus reducing instructional development time, call-center development and training. Testing streamlines brand attribute conveyance for critical marketing messaging. If instructional support material is required, data from a professional usability study provides the detailed content for user instruction development based on tasks tested. However, not every program requires a fully structured study. Even the simplest form of professional usability analysis can be highly beneficial. Take for example the following use of professional usability heuristics applied to the SNAP Spectacles. Really, How important Is The Usability Of The SNAP Spectacles? 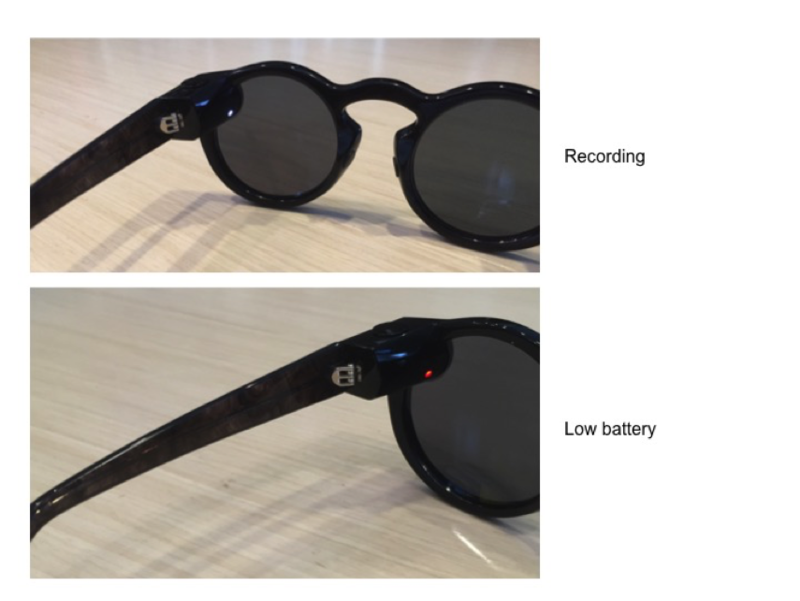 As the relatively simple professional heuristic analysis above shows, the usability of the SNAP glasses are a major problem but ultimately the larger problem is simply a failure to allocate functions that would have had an emotional resonance with the existing user base of the SNAP social media platform. The Spectacles simply fail on the most important structural level in terms of feature function allocation and mapping to the underlying engagement model of SNAP. Even if outstanding usability performance were present in the SNAP hardware, the Spectacles would have likely been a failure in the marketplace. The fundamental question that should have been asked by Wall Street and now investors in SNAP is how does any new hardware – or, for that matter software innovations – engage and expand the SNAP user experience that currently drives its user base to higher levels of engagement. In the field of formal usability science, this is known as function allocation. What can the SNAP Spectacles do better, actually much better, than the user’s smartphone? The answer? Nothing. Producing a novel image capture channel without attendant engagement innovations is and always has been a non-starter. The Human Face Is A New Frontier For Hardware Design The Perception of faces is so important in our evolutionary and day-to-day existence that face perception has its own primary neurological center in the human brain. Anything associated with the human face is loaded with special significance and embedded meaning. Objects positioned on the face undergo instantaneous assessment when viewed by others in ones social sphere. The industrial designers of Google Glass applied their own biased visual style to the design of Google Glass to create a wildly differentiated and high-tech visual impression, an impression that instantly communicated negative functional attributes of privacy over-reach and high tech elitism. Google Glass was dead in the water from day one based on naïve application of industrial design visual style theme that was both inappropriate and psychologically off-putting. This was an unfortunate mistake on the part of the Google Glass industrial design team, because the underlying technical platform was and is exceedingly innovative and potentially useful. Today, in certain occupational applications where visual style is moderated by professional need, Google Glass is apparently finding a rich set of new applications. In the same way that SNAP Spectacles failed to drive customer engagement with its core platform, Google Glass failed to drive customer acceptance for its core feature set based on how it appeared visually, not how it functioned technically. Heat map of a pharmaceutical dosage table generated from MUS eye-tracking data showing confusion over a specific dosage combination required to properly deliver the associated drug. The Future Of Visual Gaze-Tracking Hardware Even though SNAP and Google have produced major flameouts in the design and production of these types of interfaces, it is clear that spectacle-based data capture and information display as a structural concept remains an area of massive potential. Hardware that successfully integrates data capture of the environment with actual fixations of what the user is viewing produces exceedingly powerful insights into how we navigate our everyday lives and make decisions in a rapidly changing technology-based world. We know from our work in the use of advanced eye-tracking technology to conduct consumer research that such a paradigm is very powerful. 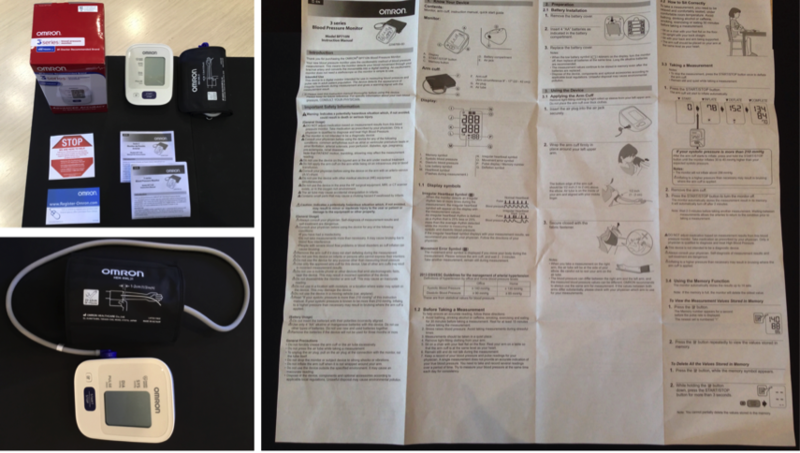 Take for example a recent study undertaken by our UX Research Lab on medical device design and instructions for use. Eye-Tracking As A Research And Data Capture Tool As noted in the list earlier in this article, one of the advanced usability and UX optimization testing methodologies available to hardware development groups is head-mounted eye-tracking. This methodology utilizes advanced data capture glasses to track the users entire visual search behavior and can record and provide highly reliable research data on what the user is viewing, how long they view certain information, which information they return to during a given task, which information they fail to view or read entirely, and a wide range of more sophisticated information including the relative measure of cognitive workload required to deal with a hardware device and/or its instruction set. This following example shows a recent study conducted by our UX Labs Group examining the relative usability of a consumer-facing blood pressure device sold in pharmacies. 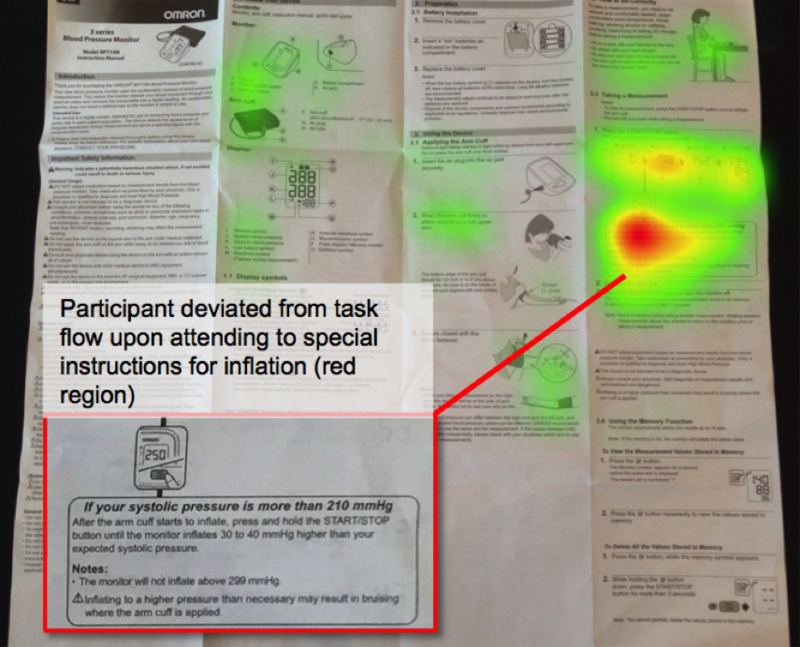 This study utilized eye-tracking to determine where in the First User Experience (FUE) consumers and users of this type of device encountered critical errors and confusion. The image below shows the component parts of the study set up. This research included an examination of the total user experience (TUX), including unboxing and use.